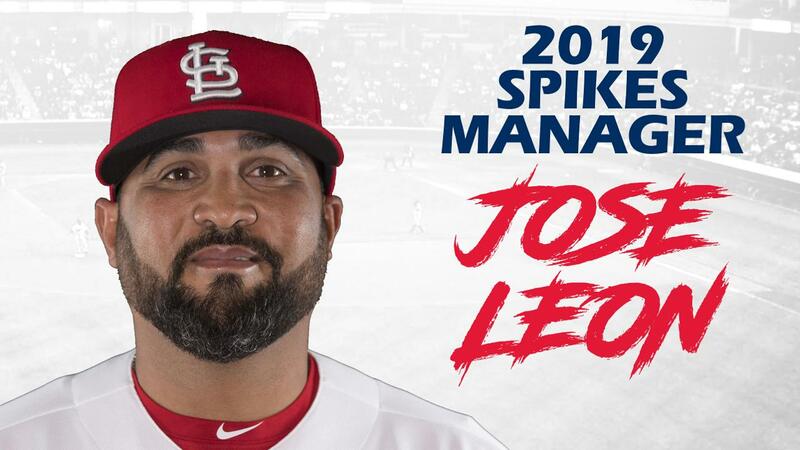 New manager Jose Leon will lead the State College Spikes' 2019 coaching staff, the St. Louis Cardinals announced on Friday. Leon becomes the 10th manager in Spikes history after serving as hitting coach for the Cardinals' number-one Dominican Summer League affiliate in 2018. Pitching coach Adrian Martin will return to the same role for his second season in 2019, while hitting coach Cody Gabella will make his Spikes debut this year. Rounding out the Spikes' 2019 coaching staff will be two more returnees, athletic trainer Joey Olsiewicz and strength and conditioning coach Don Trapp. "We are happy to give a big welcome to Jose Leon and Cody Gabella as they join our Spikes family and can't wait to see Adrian, Joey and Don back in Happy Valley for what will be a great 2019 season," said Spikes General Manager Scott Walker. The Tampa, Fla. resident is also familiar with the NYPL, having gone 1-1 with a 3.05 ERA over 22 appearances for the Auburn Doubledays in 2005. Martin and his wife Emmie also celebrated the birth of their first son, Maddux, in August of 2018. Olsiewicz and Trapp both enter the second season of their professional baseball careers. A native of Gobles, Mich., Olsiewicz received his bachelor's degree in Athletic Training from Central Michigan University, where he also played on the club baseball team for three years. A native of Mars, Pa., Trapp once again returns to the Keystone State after previously working with Eastern Michigan University athletic teams through an NSCA Assistantship Award. Don also served as a Volunteer Assistant Strength & Conditioning Coach at Shippensburg University after receiving his bachelor's degree in Sports & Exercise Science at Gannon University in Erie, Pa. in 2013. He earned his master's degree in the same field through California University of Pennsylvania's online program and also played two years of varsity baseball while at Gannon. The Spikes' 2019 home schedule begins on Saturday, June 15, when they take on the Williamsport Crosscutters (Philadelphia Phillies). Fans can take advantage of a special bonus offer on all 2019 Value Plans ordered by January 31, with 2019 Season Seat Memberships, Flex Books, and group outings for all 38 home games through September 1 also available by calling (814) 272-1711. More information can be found at StateCollegeSpikes.com.